Microscopic pieces of harmful tiny plastic are prevalent not just in the Great Lakes, but in many of the tributaries that feed into them, according to a new study published this week in the journal Environmental Science & Technology. Microplastics are tiny plastic fragments that wear off of synthetic clothing, fall off decomposing plastic bags and bottles, and are manufactured into some products. Previous studies have found microbeads, tiny plastic balls used in many personal care products like soaps and shampoos, in surprisingly high numbers in the Great Lakes. Those microbeads in turn have made their way into the food web. And research has found they can cause reproductive and digestive problems in fish and other wildlife. This new research also found microplastics in 29 rivers that flow into the Great Lakes, including the St. Louis River in northeast Minnesota. Researchers examined 107 water samples; all of them contained microplastics. "It shows how widespread the problem is," said Austin Baldwin, a hydrologist with the U.S. Geological Survey and the study's lead author. Instead of microbeads, the research team mostly found tiny plastic fibers that are shed from synthetic clothes like fleece. Studies have shown that when a single fleece jacket is washed, a few thousand to several hundred thousand microfibers can get flushed away. That's "kind of staggering," Baldwin said. The highest levels of microplastics were found in rivers in urban watersheds, like the Huron River at Ann Arbor, Mich., and the Buffalo River in upstate New York. But rivers with heavily forested shorelines like the St. Louis also contained plastics. That raises questions about where these fibers are coming from, Baldwin said. "There's evidence that these fibers are coming from the atmosphere," he said. "Tiny little pieces of plastic fibers floating around in the air." Then, they likely settle on roads and other surfaces before eventually washing into rivers. Baldwin says he's now looking at what happens to these plastic fibers when rivers dump them into the Great Lakes. His hypothesis is that they end up in the sediment at the bottom of the lakes, because unlike microbeads, which float, microfibers sink. He's currently analyzing sediment taken from the bottoms of lakes Erie and Michigan. Research showing the large amount of microbeads in the Great Lakes helped spur Congress to pass a law last year banning the sale of shampoos and other personal care products that contain plastic microbeads. That law takes effect in 2018. 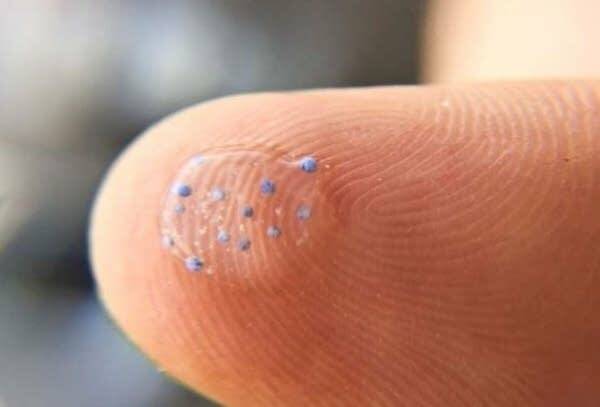 But Baldwin said it will be much harder to pin down what exactly the sources are of other microplastics, and how to best prevent them from escaping into the environment. "I think the microbeads were the low-hanging fruit. That was an easy thing to ban." Other tiny plastics, he said, will be a more difficult problem to solve.